Finely crafted in the USA from North American Hardwood, sanded & ready to finish in either stain or paint. Custom wood species available. 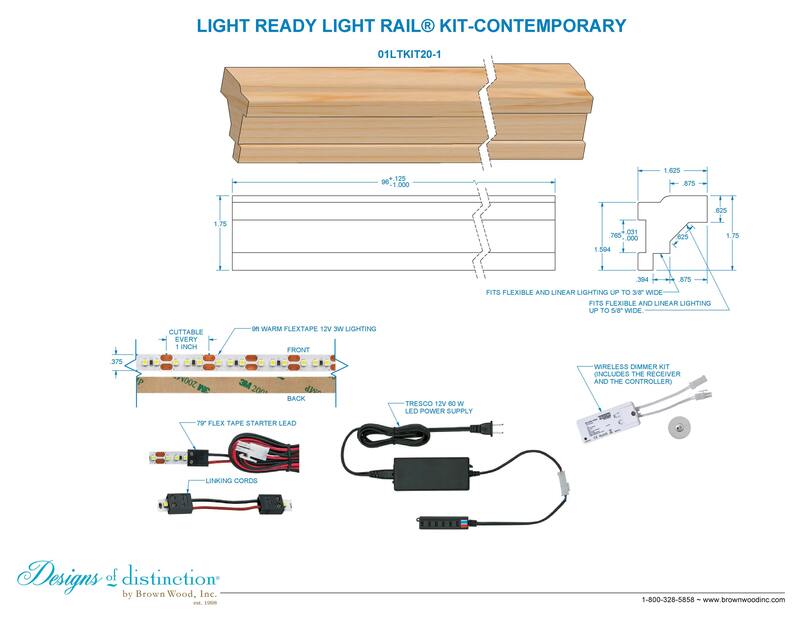 The Contemporary Light Ready Light Rail® Kit comes with everything you need to update new or existing cabinets with LED undercabinet lighting. Our Light Ready Light Rail® kits are powered by Tresco electronic supplies. The Contemporary style kit is highly customizable with any of our Light Rail wood or metal inserts to add extra glam to your new or existing cabinetry, vanities, shelving, and more. Apply to framed OR frameless cabinetry. Choose task or ambient lighting by applying LED lighting to either the 45- or 90-degree precut angle. *Additional Flex Tape 12V 3W lighting can be purchased.